Common sense tells us that drilling, testing, and grading have nothing to do with how babies, children, and adults really learn. And research backs this up. Students who had been asked to write regularly without being taught to punctuate, for instance, ended a term not only writing but punctuating much better than students in a neighboring class who had been regularly drilled, tested, and graded solely on punctuation. This must be the most tedious, least rewarding, and least effective teaching that students have to endure. But false theory, political pressures, business opportunism, and harried administrators have persuaded us to accept this bureaucratic travesty of teaching as the real think. 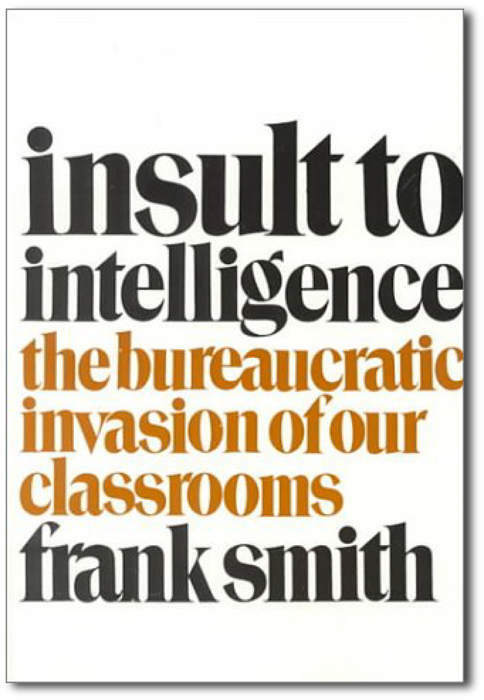 Insult to Intelligence focuses particularly on children learning to read and write, the area in which Smith has made his reputation. But his six-point manifesto on learning and teaching is applicable at every level of education, and in the context of America’s ongoing struggle to upgrade the teaching profession and to raise national standards of literacy, his book is nothing less than a call to arms.